What is XPath? How does it work in Octoparse? XPath is a language that allows you to locate specific elements from a page. Modifying XPath in Octoparse works very well with more flexibility and accuracy than the XPath auto-generated by clicking elements during the task configuration. When should I use XPath? In most cases, you don’t need to write the XPath on your own. But there are some situations where you might have to do some modification for better locating the data on the webpage. "Next" button cannot be located precisely. Where can I modify XPath in Octoparse? 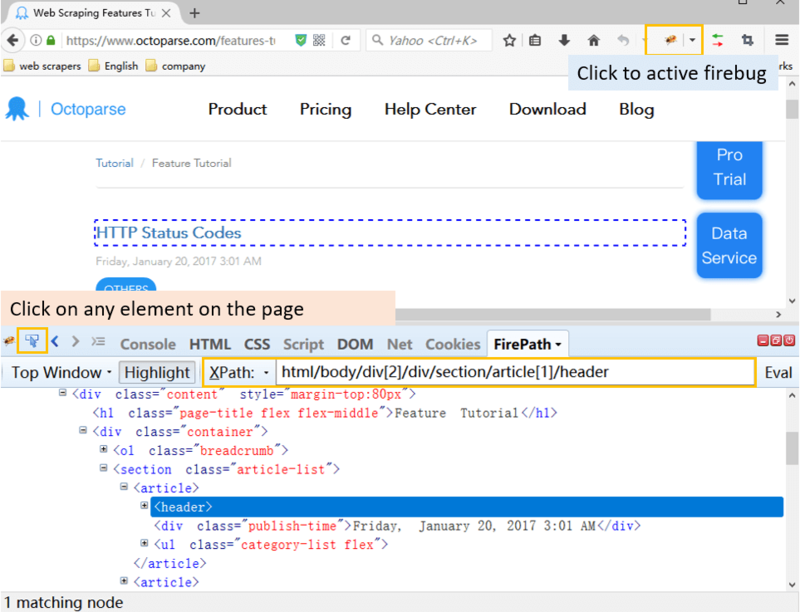 For steps like "Loop Item" for pagination or switching drop-down, you can easily find the XPath textbox under "Advanced Options". Enter the new XPath and click "OK" to save your changes. If you are new to XPath, you might need to grab some basics of HTML first. XPath locates elements based on the tags and attributes. So before you get down to write your own XPath, you would need to inspect the HTML structure of the page first. We suggest you use firebug plugin (a Firefox plugin). Firebug is very useful for looking up the element of an HTML document. Open a webpage in Firefox, click Firebug button and click an element in the page to inspect. It will bring out all of the XPath. Octoparse also provides extra help with XPath generation – XPath tool . You use Octoparse XPath tool to easily generate a working XPath syntax by setting up the appropriate criteria. You can easily find the XPath tool in "Tools" box. In this tutorial, we will go through some basics and common XPath used in Octoparse. Selects the li elements which enclose either an <a> or an <h2> element. XPath is very powerful and this tutorial is just an introduction to the basic concepts.